Li-ion is widely used in various consumer products and are beginning to be used in electrified vehicles (xEV). xEVs have the potential to be safer than conventional combustion engine vehicles, simply because they have less or no flammable gasoline/ diesel. Additionally, the xEVs have potential for safety enhancement due to e.g. freedom of design and a greater stability performance with lower center of gravity due to the large Li-ion battery pack. However, new technologies may introduce new unknown risks. It is important to study these risks to be able to proper address them by e.g. vehicle design. Today there are no intrinsically safe Li-ion cells with usable properties. The experience from the consumer market shows that there is a small probability (ppm-level or less) for internal short circuiting in Li-ion cells, potentially resulting in a so called thermal runaway and a battery fire. In a large battery pack, with many cells, the probability of a thermal runaway will of course increase due to the use of more cells. This leads to an increased risk of a cell safety incident occurring and it is thus important to minimize its consequence. For example, the cell-to-cell propagation of a thermal runaway in a single cell can be affected by battery pack design. SP Technical Research Institute of Sweden is involved in the project “Safer battery systems in electrified vehicles – development of knowledge, design and requirements to secure a broad introduction of electrified vehicles”, together with Atlas Copco, Chalmers University of Technology and Elforsk and with financial support from the Swedish Energy Agency. The project includes various abuse (destructive) tests on commercial Li-ion battery cells to study the cell response in terms of e.g. 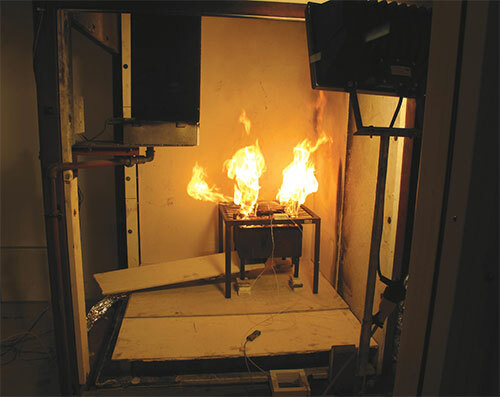 temperature, gas, fire and explosion in electrical abuse tests including overcharge and short circuit tests and exposure to fire. Figure 1 shows an example of fire due to overcharge and Figure 2 shows battery cells exposed to a propane flame. The tests showed that higher battery electrical charge level (State-Of-Charge) gives a higher heat release rate (HRR) while the total heat release (THR) is roughly the same for all charge levels. Also gas emissions were measured. The Li-ion cell contains fluorine that can form highly toxic compounds such as hydrogen fluoride (HF) that can be released. Performing experimental abuse tests is expensive and therefore thermal simulation is a useful tool. To this end, simulations means have been developed The simulation tool models the heat transfer in a pack of five cells with the aim to be able to predict the cell-to-cell heat spread for a 5-cell-pack. The simulations are performed in the Finite- Element software Comsol Multiphysics and the results are corroborated to the experimental results. Obtaining adequate data of the battery cells is crucial for the computational model since precise measurements of these data are not available; data from the literature is used in combination with sensitivity studies of the thermal parameters. The layout of the cell indicates that the thermal properties are highly anisotropic and it is showed that this anisotropicity in the thermal conductivity is of importance. The results from the test and the simulations agree relatively well until the next adjacent cell is starting to react and thus can this rather simplified method be used to predict the propagation of a thermal runaway with accurate material data input.